The Major Arcana card, The Chariot Tarot Card, is a great card to see in a reading spread as it generally indicates forward movement and overcoming fears. The Chariot is probably one of the most complex cards to define. On its most basic level, it’s about getting what you want. It implies a struggle and then an eventual, hard-won victory over enemies, obstacles or the uncertainties inside you. But there are also many underlying factors involved than overcoming a struggle and being victorious. Its energy is directed, controlled and has a goal in mind. When this card appears, you are likely to be fairly clear on what your hopes and dreams involve and what you are willing to do to make them come true. It is also a clear sign that you are working on manifesting a desire to come into fruition. The Chariot is all about motion and yet it is often stationary in obtaining those goals. It is a representation of opposites that pull in different directions but must be (and can be!) made to go together in one direction. That is perhaps the most important message of The Chariot Tarot Card. Separate the driver from the chariot, the chariot from the horses, the horses from each other and from the driver, and nothing gets done. They all do their own thing. Put them all together, with the same goal in mind, and there will be no stopping them. Confidence, focus, unity of purpose and control is needed, most especially…motivation. The card can also indicate a new motivation or inspiration, which gets a stagnant situation moving again. In general, this card points to determination and ambition. It’s about getting things done, testing and proving that you’ve got what it takes. This is a sign that you should move forward with whatever you have in mind (and in your heart) and give it your best shot. Remember, though, that you’ll need to use both your intellect and your heart, in order to be truly successful. In Work it symbolizes not to let small issues get blown out of proportion in your mind that may stop you from getting ahead in your career. In terms of Love, it’s possible that you are tempted to go too far too fast and/or that someone is pressuring you that way. An indication to reign in some control over your emotions. Finances in general may be showing a future of more abundance through your hard work. You could also be looking into purchasing something to do with transportation – a car, plane tickets to somewhere you have always wanted to go – anything of that nature. In regards to your Health, it means your life vitality is strong at the moment and to take action to make it better. 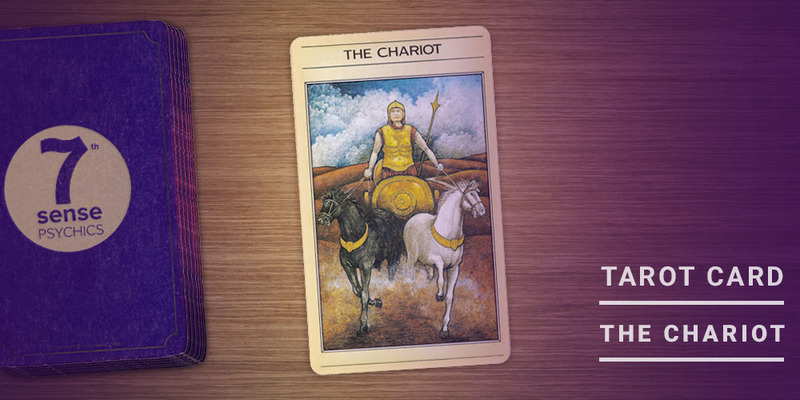 When The Chariot Tarot Card comes up in regards to your Spirituality, you may find a need to begin a search for places and people that can help increase your spiritual awareness or of likeminded beliefs. I have always read this card as a manifesting card. Whether it be a conscious choice on the person’s part or a life plan that is being put into action, movement forward in an area or all of them in your life are about to evolve into something more. This is where the card can get tricky, pulled inverted it can mean several different outcomes. If not acted upon, then the universe will make the choices for you to force forward movement and growth. It can also mean that unexpected change in what you desire to be your future shows up as in changing your mind about your career or have decided that you don’t want to get married and the church is rented and all the dresses are bought. A good reader will take into account the cards supporting the chariot to help decipher the possible actions being addressed. Previous Article7 Valentine’s Day IdeasNext ArticleWhen Is He Going to Call?